I was asked by the Novo Nordisk Foundation (specifically by Dr. John Peter Wittschieben) to say a few words from the successful applicants' perspective during the "How to Get Funding from International Foundations" info event, which took place on April 26th in Biomedicum Helsinki. To be clear: The event was very useful. Specifically it was useful due to the detailed information provided by the Novo Nordisk Foundation and JDRF, who presented during the event. In the very beginning, I was surprised to hear our Dean talk in his introduction about the "lucky ones that received the funding". In my naïveté, I always assumed that funding was distributed according to excellence and ability, not according to luck. While more experienced researchers like Mikael Knipp were able to give good advice, I could not. Obviously, I cannot boast with my own funding rates (which are about 5%, one of 20 applications being successful). No time for science, too much time for grant proposal writing? Some participants expressed surprise about the current widespread complaints of researchers about low funding rates, arguing that a rejected application leads to an improved renewed application in the next round. I agree, that the improvement might be substantial for the first few rounds, but then it becomes a game of diminishing returns. I write an average of 20 grant applications in order to get one accepted, and for 15 of these, I rather agree with E.P. Diamandis, who in Clinical Chemistry complained about the $20+ billion loss due to unsuccessful application writing. Who is a "Young Investigator?" The other question that - interestingly - was discussed (and which I had wondered about already for years), was the term of "young investigator". The bottom line was, that everybody is a young investigator who does not hold a full professorship. This might be the only sensible definition, as the average age of principal investigators has been steadily rising during the last decades (see e.g. here). 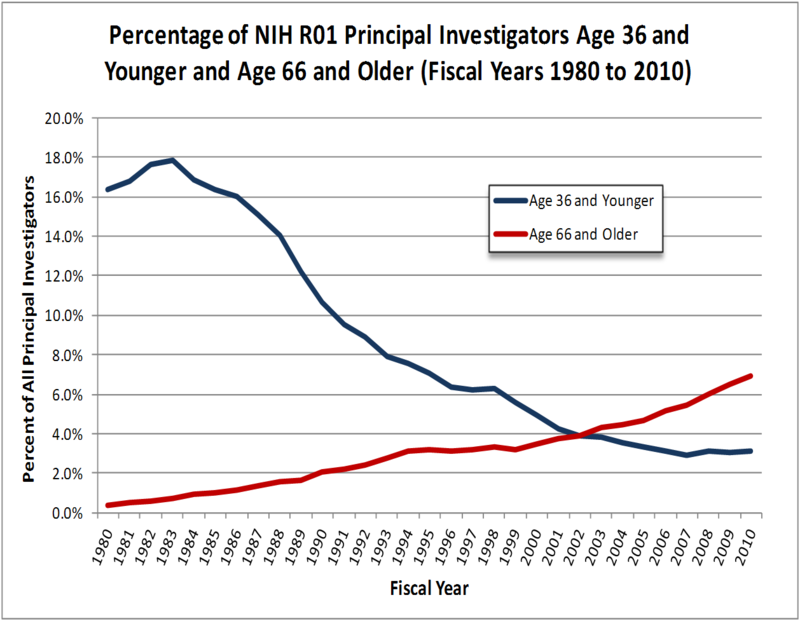 Many investigators will therefore stay forever young (or at least until they retire). Although I could not convince many (maybe nobody), I objected to the notion that is is desirable to combine the goal of creativity and applicability in academic research. True creativity originates mostly from a primary motivation and utilitarian aspects actually get in the way of creativity. This is not to say, that creative research cannot be very useful. To make them an important criteria in the distribution of funds is just asking too much from the money source, namely to be able to predict the future. Creativity and the push towards "applicability/impact" of research are not only orthogonal to each other, but are pushing into opposite directions. If the research is struggling with funding, it is difficult to be creative. The basic needs for survival need to be met before people can realize their possibilities*. In addition, when foundation ask for short term applicability, they appear to me like politicians, who think in terms of the 4 or 5-year election cycle. For much of academic research, we cannot predict its future uses. In addition, potential applications are mostly MUCH more than 5 years into the future. If the push towards applicability results in shifting the balance from basic towards applied science, the pipeline (basic research > applied research > engineering) will dry out from its source. Maybe this push towards applicability will also accelerate the blurring of the lines between the traditional universities and the universities of applied sciences. *I have to side with Marx this time: Nicht das Bewußtsein bestimmt das Leben, sondern das Leben bestimmt das Bewußtsein.